This is my new favourite quirky Aussie thing: Coffee and milk as a toothpaste-like consistency, in a squeezy tube. Oh the fun things! Would I ever buy this? There are standards, people. This is a mockery. An ultra-portable mockery. Oh, and I have to take it back: I found a 500mL carton of eggnog yesterday. So I bought it. I am planning to watch some Christmas classics (ie Peanuts and the new classic, Shrek’s Christmas), take in midnight mass at the cathedral tonight, and then snooze with Apollyon (if she’ll let me) until the 9:30 Christmas day service. Rob is off to spend Christmas with his family in Deadwood, AB. A very Merry Christmas to all our friends and family. Virtual hugs all around! Well I've been back in Canada for a week now. Australia seems quite a while ago. Back at work now with all the regular winter photocopier problems. My life just seems odd. I have several "homes". First there is the flat in Brisbane where Barb is living. Second is the condo (which we are still trying to sell). Next is Barbra Doiron's place where Barb & I have been living since late August. Lastly is the basement suite I will be living in starting tomorrow. None of them really home though. Although after coming back from Australia I realized I am such a prairie boy. Three weeks in Australia with 30 degree days, sunshine, beaches and I get back to -30 Alberta and it feels right. I missed the crispness in the air that only the praires bring. While I was gone from work 2 of the sales people quit. Coleen's last day is today and Astra's is Dec 30. I guess I can't leave anymore. Well got all the Christmas wrapping done. Was planning to get more done today, but that's how Saturdays go. Went to church tonight. It was the kids Christmas production. Got to see Lorraine, Steve and Dave. Yes, my friends, it is currently 37 degrees (Celcius) as I write this. or 310.15 degrees Kelvin (don't you think Kelvin makes it sound just that much more extreme? I love it!). People are madly getting ready for Christmas- but the've got the weather entirely wrong. Just in case anybody was wondering, they don't make eggnog in Australia for public sale. or pumkin pies. I HAVE seen cranberry sauce; a least there is SOME civility here. And TimTams, they make these cookies called TimTams. I have bought a package, and I'm sure they are laced with cocaine and heroin, because I am definitely going to buy more. I can see them being part of a complete breakfast way too often. I have to tell you the saga of the electric guy, or "the shock jockey" as my friend Barb calls him. I moved into this flat on Nov 27th. On Nov 28th, I called AGL to have the electricity put in my name. They said that they needed a meter reading. No problem, I checked the meter, which was nestled in a closet with all of its friends. But unfortunately, AGL will not accept my version of the story, as people in the past have had serious myopia when reading them and thus get "creative" with their numbers. OK. So they tell me that they will send someone to read the meter, and I must be present in order to let him into the building. I waited for him for 2 days before calling to find out what was not happening. "Oh," the clerk replied, "it can take up to five business days to get around to it. There is no set time." This was not going to work, as we were heading for Sydney the next day. So I asked her to reschedule for the 14th onward. She said she would. I hung up the phone and bet Rob that the actual guy DOING the inspection will never get that information. The morning of the 14th arrives. I wait for 3 days, at home from 7:30 am to 6pm. Then check my cell. AGL has left me a message, asking me to please call regarding access. Sure shooting, the poor sap showed up while we were gone. You will all be proud of me, I did not take my frustration out on the operator. She did, however, set up Friday the 19th as the date someone would show up. So I went out and bought a vacume cleaner, got my drivers licence, and checked out the library. Friday the 19th dawns. I am ready for this guy starting at 7:30. At quarter to noon I get another text message from the electric company saying that they can't get access. I almost wailed, "But I'm RIGHT HERE!!!!" So now, after hearing my tale of "woe in waiting", a very nice fellow is delagating this problem to the local company to deal with directly regarding schedules. Within 10 business days, they will supposedly contact me and set up a fixed time to come and read the meter. So it's still not over! OMgoodness! At least I am not working at the moment, and don't have to be at a class- I can sit here and wait for these bozos. It's just a pain. On the bright side, though, I have found a million and one things you can do/sign up for/participate in via the internet. I have filed for a taxation number, I have gotten my transit pass, creeped about on Facebook, learned everything there is to know about opals and MSN'd with Rob and my parents. My apologies to those who have been trying to use the Vonage phone number. The messages are getting through, but the phone itself is rather tempermental. Another bright patch is St John's Cathedral, where I went to church last Sunday. They were very welcoming, and I was even invited out for Christmas dinner with a family. The building, liturgy and music are all very beautiful, but this community has a heart that shines through even this. I am planning on attending here, and hopefully finding a volunteer position in the New Year. So that's my week in a nutshell. Rob is at home in Canada, and will be moving into a basement suite this weekend. the condo still hasn't sold, and funds are a little tight at the moment, with two rents and a mortgage to hold up. Please pray for us- our finances, sanity and walk with God. I was having a bit of a scaredy cat/pity party this morning when God smacked me upside the head this morning with Joshua: "Have I not told you? Be strong and very courageous...I will not fail you." So there. It's gonna be alright. Thanks for reading. Do you sip your coffee from a demitasse? Is your pinky extended? Gah! Coffee should be strong, black and chewy! It should strip paint and frighten small children. Finally, it should be drunk from a vessel that is worthy of the finest caffeinated beverage on the planet. Any mug you dare drink coffee from should be big enough to hold 20 ounces of Joe, and be big and heavy enough to use as a melee weapon should the Zombie Apocalypse finally come. Your wish is our command. This mug's handle is shaped like a face-smashing set of brass-knuckles, and will put anyone around you on notice: I'm drinking my coffee, dammit. Interrupt me at your own physical peril. Well, it’s down to the Destroyer and me. Rob and Barb D got off this morning, only a day late. It turned out that the original flight had been cancelled a whole month and a half ago, and our agent failed to alert us of this before we left. So Air Canada put us all up at the airport Holiday Inn. I started to develop a cold in Canberra, and so spent most of the day sleeping on those heavenly beds. In the evening we caught some local theatre, “You’re Nobody Until Sydney Loves You”. We also explored King’s Cross area and drove across Harbour bridge, just to say we did. Back to Canberra. It was one of our favourite cities in Aus. It had the good fortune of being chosen as the national capital in 1908, and could be entirely planned, as there was nothing there to start with. This makes it a dream to drive, and most good stuff is in walking distance of each other. Also, the city has an emphasis on green space. We decided to call on the Canadian High Commision to lodge my declaration (the Canadaian gov’t likes to know where it’s people end up). The lady behind the desk had an expression which practically begged to “Please leave me alone and go away”. That only made me more enthusiastic to make her do something to earn all you beautiful people’s tax money. The irony arrived in my inbox later that day, informing me that the HIGH COMMISSION (The top representative of my country here) cannot process the paperwork, as Canadians living in Queensland must register with the Sydney consulate. Our bureaucracy is alive and well abroad, available in both official languages. We moved on and toured the Parliament buildings, most of which are under a hill. Then we summitted Telstra tower on Black mountain, which gives a fabulous view. Later that night we hit King O’Malley’s (look him up, it’s a story of the scheister to end all scheisters), a late night pub. Then we window shopped in the closed arcades and enjoyed the sculptures until midnight. The next morning, Rob and I dropped off Barb at the National Art Gallery, and we went to geek out at the Canberra Space Centre. One of their dishes produced the televised clip of Neil Armstrong stepping on the moon. The same antenna monitored Armstrong, Collins and Aldrich’ vital signs during the mission. It was cool to see the original EKG of the three. A nerd’s paradise!!! We reconnected for lunch and then shopped the stores we had scoped out the night before. We then left for Sydney, arriving around 8 pm. The next day we toured the Sydney Opera House, rode the ferries up and down the Harbour. Several misconceptions were dissolved for me: The Opera House is not smooth and bright white, but rather shades of creamy and tiled in patterns. Second, it is several buildings, not one. Who knew? Again, check out the story of building the Opera House (Wikipedia?) as it is an amazing tale of its own right. By that point, I had decided my cold finally deserved drugs, and spent the rest of the day snoozing off the congestion. So, as I said, it’s down to me heading back to Brisbane along the Pacific Highway. I drove from 9:45 am until 7pm, and landed in Woolgoolga for the night. It’s been raining steady all day, and I have no desire to drive a highway I don’t know in a car almost as old as I am (even though he’s been a faithful old gent so far) in the dark and the rain. So one more stop. So, we are now on our way to Canberra and Sydney in the HMS Destroyer. We have managed to get things basically set up in the flat, and even had time to catch a bit of theatre, “Nunsense”. My parking permit has come through already, thanks to the magnificent effort of Tony, from the city council. He arrived in the morning to get the car’s registration details, and hand delivered the permit later that afternoon. It restores my faith in humanity! Otherwise, we would have had to move the car every 2 hours and plug meters. We took a day trip up the Sunshine Coast which included the Australia Zoo (of Steve Irwin fame, "Crikey!!") and a pineapple plantation with ice cream parfaits and tour. Then we hit the beach for the first time in Australia. The sand is powder fine and white. We jumped around in the warm waves until nearly sunset. The we drove back home into an amazing lightning display. Yesterday, we took off in search of the “Big Banana” at Coffs Harbour, but got distracted by Byron Bay. They have the most powerful lighthouse in the Southern Hemisphere, and can be seen 40 km away. It is also the easternmost point of Australia- next stop, Chile. 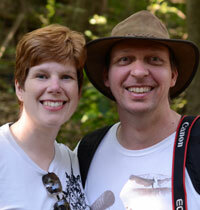 Rob got some great photos, and we walked the path around the craggy coastline. We then explored town, in which it is claimed the artists practically fall out of the macadamia trees. We did see some pretty artsy stuff, and Barb bought a beautiful top made of recycled saris. We headed back to the vehicle around 4:30, and you could already smell the marijuana in the air. We headed on, driving through rainforest highway. We even saw wild kangaroos! We finally landed in a town called Tyndale, and took up 2 rooms. It turned out each room comes with its own friend in the shower. Barb D had a big spider in hers, and ours had a wee lizard that popped out of the drain when I turned the water on. The establishment had had definitely seen better days, too. The next morning arrived cooler and sprinkling. We still have to get to Canberra tonight. We are in Brisbane, Australia now. We found an apartment. It’s a one bedroom place in a heritage brick building. It’s in Fortitude Valley which is a suburb of Brisbane just east of downtown (or CBD, central business district like the Ausies say). It is right close to sort of trendy shopping area a lot like Whyte Avenue in Edmonton. I’ll try to post some pictures soon at our website. We also found a car for Barb, a 1986 Toyota Corona station wagon. The funny thing is it only has 30,000km more than our 2005 Toyota Matrix. The wagon came in handy as we went furniture shopping last week. We got a hide-a-bed, table and 4 chairs, desk, a couple shelves and a air mattress. A bit Spartan, but quite homey. Today we got to be tourists for the first time in Australia. We went to the Lone Pine Koala Sanctuary. We got to hand feed kangaroos and wallabies, see dingos, wombats, giant fruit bats and then we all hugged a koala. They are adorably cute although they do smell bad. Tomorrow we plan to head downtown to see the sights, and later this week is a pineapple farm, the Australia Zoo and some beach time. It’s been in the high 20s all week. We got a couple days of rain, but the next few days should be sunny. For all of those trying to get us by e-mail, or Vonage phone, we should be getting high-speed internet tomorrow.